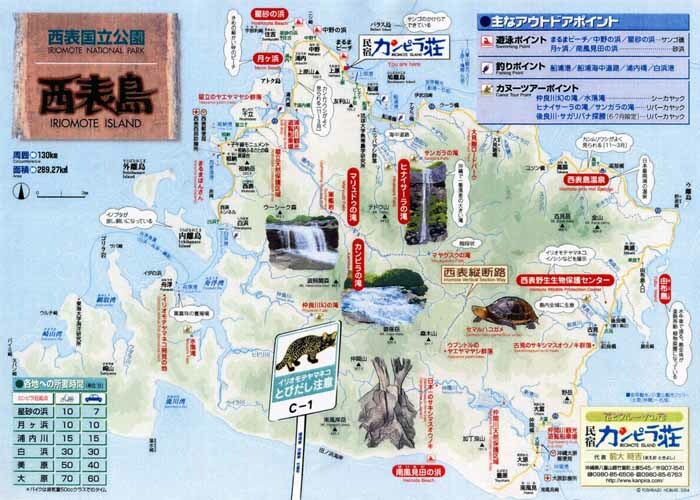 In Iriomote island, there are not so many tourist facilities unlike in the Okinawa Island. Thus it is not a place where we play in spending much money like the other general tourist resorts, frankly speaking, a behavior that strutting around a beach with a boom box or a surfboard does not match an atmosphere of the island. However in contrast, we can enjoy its plain great nature very much. Well, I will introduce on the points to see in the island with a little bit of my dogmatism and prejudice. Further, as for information of the access to Iriomote, the stay and the leisure, "Okinawa rito joho" (price 480 yen) published by Ringo Promotion Inc. is very useful for people who are good at Japanese. Also, see the Web site of General Guidance to Iriomote Island.